An ecovillage is an intentional or traditional community using local participatory processes to holistically integrate ecological, economic, social, and cultural dimensions of sustainability in order to regenerate social and natural environments. Ecovillages are communities with vibrant social structures, vastly diverse, yet united in common ecological, economic, social and cultural values and goals. They spring from the good intentions and creativity of citizens, and their willingness to make a difference. There are currently an estimated 15,000 ecovillages across six continents. Ecovillages have some of the lowest carbon footprints on planet. Studies of carbon dioxide emissions in Danish ecovillages find they are 60 percent lower than the national average. 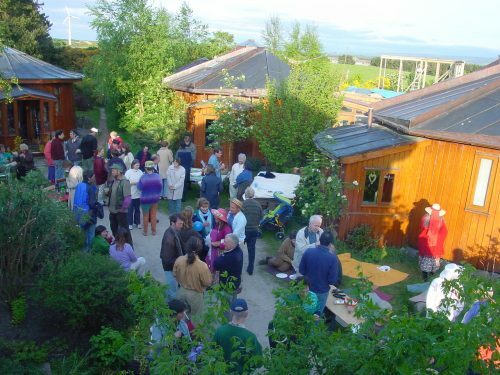 Those of German ecovillages are 35 percent of the national average, the Irish ecovillage in Cloughjordan has the lowest measured ecological footprint in Ireland and Findhorn Ecovillage in Scotland has the lowest documented ecological footprint of any settlement in the industrial world. The Global Ecovillage Network (GEN) was set up in 1995 to support the experimental creation and preservation of human settlements that not only sustain, but regenerate their social and natural environments. GEN envisions a world of empowered citizens and communities, designing and implementing their own pathways to a sustainable future, and building bridges of hope and international solidarity. GEN-Europe is the European ecovillage association, which support the de­vel­opment of ecovillages and networks in Europe, the Middle East and Africa.